On August 3, 2009, a road safety audit was initiated for the intersection of IA 1 and County Road F-67 in Johnson County, Iowa. 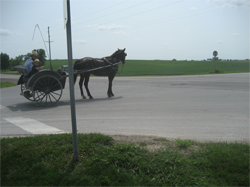 Due to the high volume of traffic accessing the cheese producing plant (Twin County Dairy, Inc.), a grocery store east of the intersection, and a large Amish community with horse-drawn wagons and carriages frequently sharing the roads with motorized vehicles, this intersection has developed a crash history that concerns the Iowa Department of Transportation (Iowa DOT), Iowa State Patrol, and local agencies. Considering this, Johnson County and the Iowa DOT requested that a road safety audit be conducted to address the safety concerns and recommend possible mitigation strategies.